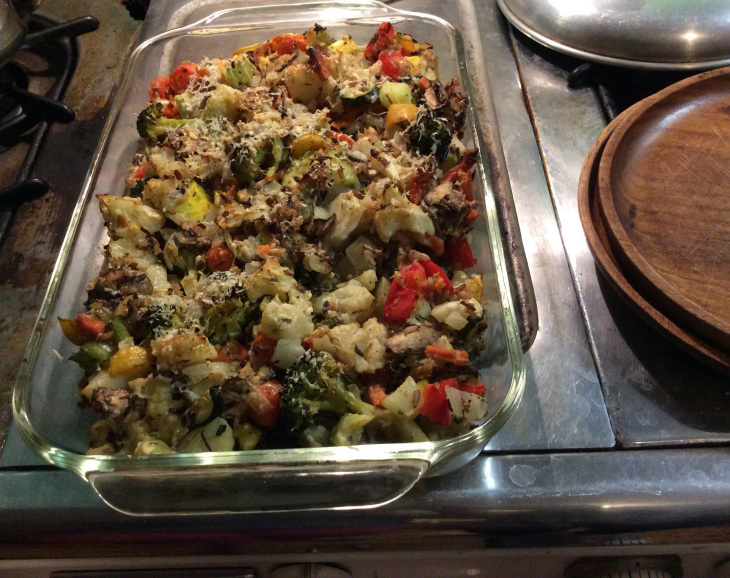 A delicious dish Rick introduced me too is a compilation of vegetables, brown rice and cheese, which we first serve as fresh steamed veggies and rice and then bake leftovers into a casserole. As usual, amounts and choices are arbitrary – these are what we like. For the casserole we actually kind of throw in whatever we have left over; including once a few sweet potato fries. Red or yellow pepper (1-2); I confess that I’m not a green pepper fan, but go ahead and add if you are. Mushrooms (1/2 lb.) Cremini are our go-to for this. Sliced. I serve both dishes with a green salad, usually with an olive oil/lemon vinaigrette; often including a small head of crushed garlic in the dressing; still subtle but tangy.